This is a fun ice-breaking game and it will help your guests getting warmed up and observe each other. 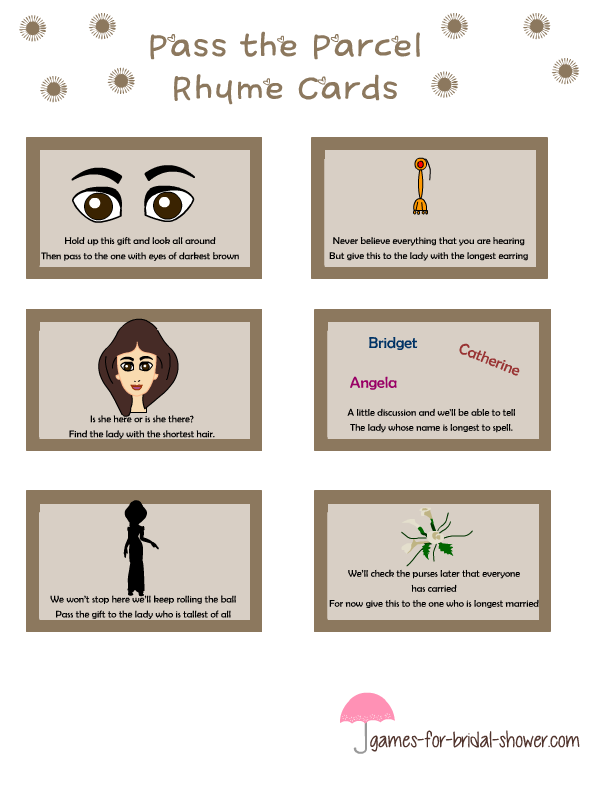 I have collected some fun rhymes from the internet and made these cute game cards. 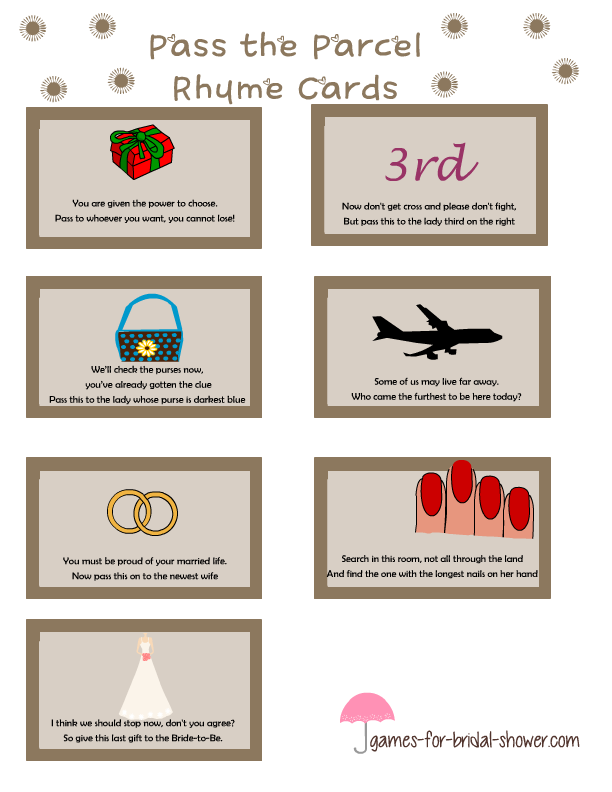 How to Play: First print the game that matches the color of your bridal shower party theme and then cut the cards. 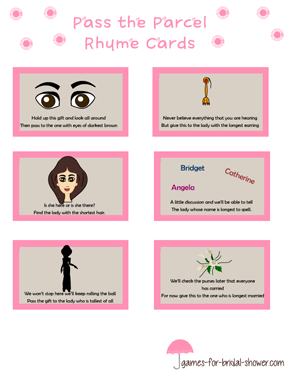 Now make a parcel with a gift for bride-to-be in the innermost layer and the last card in it. 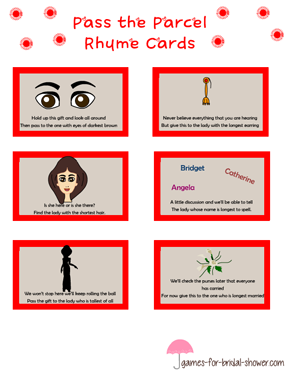 Keep on placing cards in each layer and add some small gift along with it. You should prepare this parcel 1,2 days prior to the party. Now ask the guests to sit in circle and they should keep on opening the layers and pass the parcel to the lady about whom the rhyme is written. At the end this gift will reach the bride-to-be and she will open it and enjoy her bigger gift. 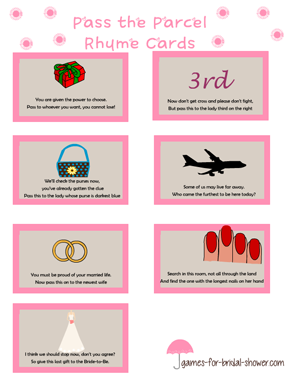 If the color of these rhyme cards matches your bridal shower party then click on each of the images one by one and save or print the larger image. You can then cut along the edges of each card to get 13 rhyme cards for this game. This is a set of rhyme cards for this game in pink color. These cards are decorated with cute original graphics. Red is one of the favorite colors for weddings in India and many other places. If you like to use red colored rhyme cards for this game then click on the images shared above and save the larger images one by one.